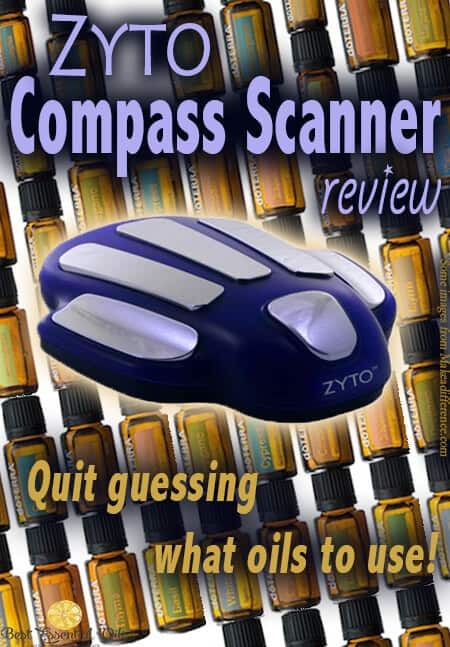 My Zyto Scan doTERRA Review - Quit Guessing Which Oils to Use! I wrote a Zyto scan doTERRA review since I bought one and thought you might like to know how I feel about a Zyto Scan doTERRA. It can help you quit guessing which oils to use. doTERRA Diffuser Reviews – What is the Best Essential Oil Diffuser? We were really tired of paying $40 a month to Zyto Scanand iTovi has an option to just buy it. Other than that, they have very similar results and both are very good. Are you tired of guessing what essential oils to use? I sure was until recently. It’s so frustrating reading the books or hearing testimonials from others and it seemed like different oils worked for different people. Or you have a health issue and you don’t know what’s really causing it and you could spend forever guessing about it. I felt like I was wasting a lot of money trying a lot of oils and some worked great but others didn’t. I’ve also been signing up a lot of people for doTERRA and it was so hard to recommend certain products to them. So let me back up a bit and tell you about how I came to join doTERRA. I had a friend that posted on facebook all the time about doTERRA and it sounded interesting but I didn’t need one more healthy thing to spend my money on. Then my daughter got sick and I figured it wouldn’t hurt to have my friend come do a Zyto Compass Scan and see if anything came up. My friend came and scanned the entire family and made up little sample vials for everyone in our family. Then something crazy happened. We all felt so much better for a week or so until we ran out of the oils. So we signed up – and bought a ton of oils when we did – cause we wanted to buy all the oils that came up on all our tests. Then we used the oils for about six months and had so much success that we decided to start this blog and share it with others. The problem is that the friend who we signed up under, moved out of state so we weren’t able to do a scan for the last 1 1/2 years. I kind of forgot about the scan and didn’t know what it was called – until recently. I kept hearing so many people say how great the scanner was. I researched and decided to go for it and purchased it to help us with some health issues we were struggling with finding answers to. It suggested that I take black pepper essential oil, which I thought was odd but I started taking it internally – 2 drops 3 times a day. And an issue I had been really struggling to find a solution to was really improved. Then I looked up black pepper and it said it helped this problem. I had never heard that before and it helps me more than any other essential oil for this problem. I’ve been struggling to keep my urinary tract healthy for a year or so. I would take the standard protocol and it would help for a while then I would get lazy and forget to take my oils and it would stop working. My scan told me to take Juniper Berry essential oil so I gave it a try and it has helped more than anything. Every time after eating popcorn I would get a little tummy ache. (Yes, I do indulge every once in a while. But I’d rather eat white popcorn cooked in a pot with coconut oil, sprinkled with Real Salt and nutritional yeast than any sweet dessert out there.) So I did a scan the next morning after eating popcorn and it told me to take Zendocrine Detoxification Blend. I did and felt tons better in 20 minutes. Normally I would take DigestZen Digestive Blend and it definitely helps, but Zendocrine helped me even more! I had the stomach issues for a few days. Mostly my tummy hurt a lot and I burped stinky burps but that was about it. I couldn’t find anything that helped so I did a scan and it told me to take Zendocrine Detoxification Blend. Viola! Literally, within 20 minutes I felt tons better. It started hurting again a few hours later so I took Zendocrine again and that’s all it took. My three days tummy ache was gone. BTW, I take Zendocrine on a regular basis now and stopped taking a lot of other oils I was taking for similar digestive issues. I started feeling under the weather, so I did a scan and it told me to take black pepper essential oil, wild orange essential oil and Purify Cleansing Blend. I would normally take the On Guard + capsules and black pepper and wild orange are in it but when I made a capsule with just black pepper and wild orange, I could feel it working immediately. Why didn’t I get the Zyto Scanner sooner? My son has bad dreams on occasion, anxious feelings and behavior issues. We’ve tried all sorts of oils for it (probably too many all at the same time) and weren’t having a ton of luck with it. His scan said to take thyme essential oil and lavender essential oil. We’ve had really good luck with the lavender and love it’s calming properties. Not to mention it’s way easier to only use one oil and we’re saving tons of money because it’s a lot less expensive than other oils we were using. The best part of it is that it’s so individual. Take a tummy ache, for example. It could be caused by so many different things and then even more treatment options. Where would a person even start? Scans have revealed for my tummy aches to take Zendocrine Detoxification Blend, my husband to take ginger essential oil and my friend to take cinnamon essential oil. All similar symptoms but a different solution to each problem. It’s great because it tells you to take a certain oil and you don’t even have to know why. But the problem is that you don’t know what’s wrong. You may wonder why you should take that oil, so it makes it harder to know how to use the oil. Zyto actually makes a full scanner that tells you a lot more about what body systems are affected, what back joints are out, etc, etc. That would be so much better but it’s about $6,000. So I suggest just reading the Modern Essentials book under the oil it suggests to take and that will usually give you a big clue. If it doesn’t, just keep an open mind about things. We’ve had the scan say we needed oils we didn’t know why and then a few days later it became very obvious why it said to take that oil. If you use it to scan people you are signing up or who are already under you, you will likely find oils that work really well for them and there will be a lot higher chance that they will continue to purchase the oils (think LRP) or to sign up – it worked for me! Some Wellness Advocates even charge a small fee for those under them to use the scanner so that could definitely offset your costs. I’ll let you read on their site how it actually works because I don’t really understand the science behind it. But I can tell you that it does work. The main thing I couldn’t find when researching is how often you should do a scan. A lot of people say to only do it every month or two but we’ve been scanning a lot more than that because of acute problems. But a lot of our scans are returning the same thing consistently, so we’re getting to a point where we will start scanning less. When you do a scan, it actually changes your energy so you want to wait at least three days in between a scan so it will be accurate. Interested in buying? Click this link to go to the Zyto Compass website and purchase one for yourself or learn more about it. My husband and I have been using natural solutions since before we were married, so when we were introduced to doTERRA essential oils about six years ago it didn’t take long before we were addicted! We love how pure and potent they are. We started this blog so we could share our experiences and you could learn all about doTERRA essential oils too!. My husband and I also blog at GlutenFreeDaddy.com together and I also blog at MyNaturalFamily.com, InspiringCooks.com, CleanEatingRecipes.com and MommyBearMedia.com with help from my mom. Is there any way to find someone close to me that would possibly have this scanner and oils? I’m not sure. You could try contacting Zyto and see if they can help you. Wow–this is the first I have heard of this. Would be wonderful to check out. On the Zyto Compass website it also has an affiliate link that you can sign up for to help offset the monthly fees. I would like to try the scan and see what comes up for me. Have to find someone with one. I’ve got to find someone in my area with one – I think it could help me with my son’s adhd issues. I have never heard of this, but it sounds really cool! Wow this sounds cool. I would love to try it. This sounds so interesting! Thank you for sharing about this. Thank you for the information! I just purchased a Zyto and will be trying it on new customers! This sounds so neat. Thanks for sharing! I wonder about it. But love the concept. I would love to have someone do it for me. I have never heard of this before! Very interesting. I had never heard of a scanner like this before. I of course am a bit skeptical until I can study the science behind it, but it sounds interesting to say the least. I would love to try this!!! 🙂 The Zytoscan would be so neat to use on all of my family and friends! I read this post because I was curious about this scanner & if it actually worked or if it would be a waste of money. I have to say that I’m definitely intrigued. I, too, have digestive upsets and use Digestzen but sometimes it just doesn’t work fully. Last night I tried Zendocrine like you mentioned and within 10 minutes my tummy was fine. Thanks for this information. I think I’ll be saving up my money to add this scanner to my essential oil health routine. This is interesting. Your blog post is the first I’ve heard of this scanner. I’d love to try this! Thanks so much for the information! I found it helpful and am thinking I may want to invest in one of these down the road. I had a scan done in connection with a weight loss program but I didn’t know you can purchase the scanner. I would love to be able to speak to you regarding the use of oils. I would appreciate your advice on the essentials to begin. Amazing and wonderful …would be such a great tool for health and for serving others, as well. Thanks for posting about this scanner. My best friend briefly mentioned it and I was wanting more info on it! So glad I found your blog! I really like the idea of this machine. Would love to try it out! I’d love to try the zyto scanner but don’t see the worth I purchasing it for myself. It’s unfortunate there’s nobody close to me that has one I could pay to get a reading on! Thanks for the information about it! Thanks for sharing this review. I have never heard of this product but it sounds like it can be very helpful in using the oils. You are welcome. We sure enjoy it.